What I.D. and other documentation do I need? Do I have to have any special skills in order to come on a trip? Is ClubRust only for Christians? Who can come on a trip? When are the dates for this year’s trip? Do I fly into Mexico? What forms and waivers do i need to fill out? How many meetings must I attend to go on a trip? Where does my drinking water come from while I'm in Mexico? How does ClubRust select the families that receive the houses? How much does each house cost? Where does the money to pay for the houses come from? How can I donate money towards the cost of a house? Can I help even if I don't go on the trip? How long does it take to build one house? How many people does it take to build one house? How many houses does ClubRust usually build each year? Will I be able to make or receive calls in Mexico? Can someone contact me while I'm in Mexico? Will I have to buy my own meals while I'm in Mexico? Where do we stay in Mexico? Where do we build in Mexico? Are the sleeping arrangements co-ed? Will there be medically trained personnel available in an emergency? Is there a minimum age for children on the trip? Can unaccompanied youth (under 18) come on the trip? Who's in charge of ClubRust Anyway? Why are you called ClubRust? We recommend getting a US PASSPORT CARD. Re-entering the US is MUCH FASTER with this new RFID enabled CARD. 1) EVERYONE will need either a US PASSPORT or a US PASSPORT CARD. Note: While an Enhanced Driver's License (EDL) is acceptable for re-entering the U.S, it is NOT a valid I.D. for entering Mexico. 2) All minors (18 and under) traveling without BOTH Dad AND Mom need additional documentation (a notarized travel consent form). Please check out the waivers page here. Nope! Your good attitude will guarantee that you will be invaluable on the trip. Is ClubRust only for Christians? Absolutely NOT. Although ClubRust is Christ-centered, we welcome anyone with a good attitude. Folks from many backgrounds and walks of life regularly join us on these trips. Families, groups and individuals are all welcome! Cost is $450 per person, $350 per child under 12 years old, if paid by April 15. Fees increase after April 15. This fee covers room and board while in Mexico, and transportation between San Diego and Mexico. This fee does NOT include any portion of the cost of materials for the house you will build, nor does it include your transportation costs for getting to or from San Diego Airport where we pick you up. In other words, you will need to purchase round-trip airfare to/from San Diego, CA. (Lindebergh field, airport code SAN). 6 days long. You should arrive at the San Diego Airport on Tuesday no later than 2 p.m. We build Wednesday through Friday. Saturday we "tour" the area and visit with our Mexican friends, Sunday we drop you off at the airport by 2 p.m. Here is a complete list of what you will need. The 2019 Summer trip dates are Tue June 25 through Sun June 30. No. You fly into San Diego airport, Lindbergh field (airport code SAN). Your flight should arrive NO LATER than 2pm on Tuesday the first day of the trip. We leave at 3pm sharp from the airport. Your return flight should depart NO EARLIER than 4 pm on Sunday. Go to our online registration system page here. READ THE INSTRUCTIONS, then select START/RESUME/UPDATE to start the process. You will need your very own unique email address to create a new (or update an existing) application. Early-bird registration is over on April 15, the deadline for registering is May 15. 1. You must register online Here. 2. You must print out, SIGN and mail us the Trip Waiver Form. 3. A Minor traveling without EITHER parent has to have the parent(s) NOT coming on the trip fill out, sign and NOTARIZE this Consent to Travel Form. 4. A Minor traveling without BOTH parents has to have a parent fill out and sign this Medical Treatment Authorization Form. Detailed instructions for all waivers and forms is available Here. If you've never been on a trip before, we suggest that you attend an informational meeting (held in an organizers home) to acquaint yourself with the trip and ask any questions you may have. EVERYONE registered for the trip should attend the pre-trip orientation meeting, where you will pick up your trip T-Shirt, and get important last minute details. The date of the orientation meeting will be announced by May. Details will be emailed and posted on the website. Where does my drinking water come from in Mexico? ClubRust provides all the purified and filtered drinking water you need. You will ONLY drink the water we provide you. The families go through a review process overseen by local pastors and community workers. This process ensures that the families really own (or are buying) the land we build on, and show evidence of need. To foster and develop community mindedness, families are required to donate 200 hours of community service to receive a home. The house, latrine, and concrete work cost $9,400 per site. From You! Generous churches and individuals such as yourself donate all funds necessary for purchasing the materials for the houses and latrines. All donations are 100% tax deductible. You may enter a donation amount when you fill out the trip registration form, or donate online here. Yes you can! The DONATE link on our web page lists several ways you can make a donation towards the cost of a house or latrine. It takes three days to build one house. We generally have around 20 to 25 individuals working on a house. ClubRust builds 3 to 6 houses and latrines every year. We meet at this location. ClubRust organizers will be wearing colorful ClubRust T-shirts. Yes, coverage is getting better all the time, BUT sometimes at international roaming rates. Do you really want to pay $2.00 a minute to talk to someone? If you bring a cell phone with you, please secure it on your person at all times. Small electronic devices have a tendency to “change ownership” if not watched closely. For emergencies only, you may be contacted via email (preferred) or phone. Here is our list of emergency contacts. Voicemail is checked once a day only on the main contact number. No. The trip fee covers all your meals while in Mexico. You may need to buy a snack on Tuesday before we pick you up, and possibly your lunch on the day of departure in the U.S. (various fast food restaurants). Your accommodations will be the rustic facilities at Rancho La Paloma. This is home base for many humanitarian outreach groups in Baja California. The facility has a pool, eating area, dorms with bunk beds, bathrooms and showers. You may also camp in tents. 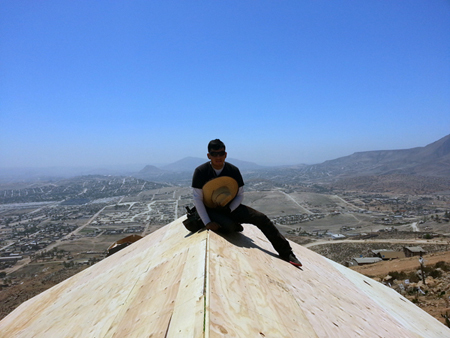 We build homes in settlements (colonias) west of Tecate, Mexico about 2 to 5 miles south of the US-Mexico border. Hahahahaha. Very funny! The dorms are segregated by gender. There are some family rooms for married couples with young children. Married couples may sleep together in tents. We ask all other couples to be segregated by gender when tenting as well. Yes, we usually have Nurses and EMT's that volunteer on the trip. We are also close to a medical clinic and a doctors in Tecate. ClubRust has an evacuation plan that can get you to a U.S. Emergency Room in about 60 minutes. Is there a minimum age limit for children on the trip? Not really. Children younger than 12 should have a parent or guardian with them willing to closely supervise them. Please be advised that the work site is a CONSTRUCTION ZONE, and that CHILD CARE IS NOT PROVIDED. No. Youth under 18 years of age should have a designated adult guardian accompany them on the trip. A parent, youth group leader, relative or close family friend has to come along. The chaperone must accept this responsibility prior to the youth signing up for the trip. ClubRust organizers cannot be chaperones, as we have many responsibilities with the entire group as a whole. No one person is in charge of ClubRust. The organizers are your dedicated servants, doing all of the behind-the-scenes logistics so you can have a great house building experience. All content Copyright © 2017 ClubRust, Seattle, WA. Last modified on 08-Jul-2018.